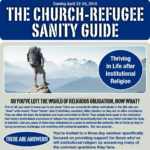 Church Refugee Sanity Guide Series: Eleven thirty-minute video sessions. during a transition away from, and out of, hierarchical expressions of organized Christian religion. Many desire a more scripturally accurate, humanly authentic, and relational vibrant existence beyond Sunday school, singing, offering, sermon, restaurant, and back home . . . week after endless week. Many long for an expression of faith in Christ that is unencumbered by personality, politics, power, and purse. Many are tired of feeling like nothing more than a human resource for a machine, another’s uncrucified ambition. Many have reached a place of being spiritual comatose-inert after decades of passive listening-but having experienced very little real outfitting for life and service. Is there not more to being a follower of Christ than bringing my person (attendance) and my money to listen to a lecture once a week? Many have begun a mental, spiritual, theological, relational, and social journey out of what they have always known and considered to be the only way to “serve Christ.” In the early stages these people can feel very confused, alone, slandered, threatened, and relationally marginalized, even black-listed by former friends. In this Church Refugee Sanity Guide Series I try to address issues and questions common to so many who fit any or all of the above descriptions. I trust that through this series you will discover that it is possible to find a life transforming, enriching, satisfying, and biblically conformed existence in Jesus Christ, regardless of what type of “meeting” you attend–sanctuary or living room. It is not about meeting venues. It is about heart values. I trust you will find confirmation, healing, and liberty for your heart as the result of investing time in viewing this series. Click the active link to take you to each individual lesson. You are not alone and you are not crazy. What happens to us psychologically during a major transition? 1) Stability/comfort, 2) discontinuity/awareness, 3) disembedding and more. The power of “no.” How to appropriately say “no” to authority figures. How to have functional human relationships, rather than codependent or hierarchial relationships. Session Five – What about my friends and family? How to more successfully navigate our relationships when others do not understand. Session Six – What about authority and submission? What do these issues look like outside of traditional church structures? Session Seven – What about community and fellowship? If we don’t go to church, what will we do for friendships? Our current church friends will reject us. Session Eight – What about praise and worship? Music and singing is such a significant part of my walk with the Lord. I will miss the praise and worship service too much. Session Nine – What about evangelism? If I don’t attend church how will I do evangelism and discipleship? Session Ten – What about our children’s needs? All my children’s friends are in our present church. If we leave, they will suffer. What will we do for their socialization needs in an healthy environment? Session Eleven – What about money and giving? I have been abused by mandatory tithe teaching and by being fleeced for the religious ambitions of leaders. How can I ever trust again to give financially or with my time and talents? Copyright 2016, Dr. Stephen R. Crosby, www.stevecrosby.org. Would you like to partner with us in distributing our materials and perhaps generate some income for yourself? Please go to www.stevecrosby.com for details of our Affiliate program. This ministry is sustained by the freewill offerings of those believe in the message of a radical grace in a new covenant understanding. If this article has been a blessing to you, would you prayerfully consider making a contribution through our Paypal button to help? Thank you and God bless you.